Life in Film are Samuel Fry (Guitar and Lead Vocals), Dominic Sennett (Bass Guitar and Vocals), Ed Ibbotson (Guitar and Vocals), and Mickey Osment (Drums and Vocals). If you watch one of the many videos from London guitar pop band, Life in Film, turning out an impromptu acoustic performance in the middle of the street, their own garden, or a newly opened Burberry shop, you hardly notice the gimmick – but you instantly recognize their immense talent for song craft. Their ability to strip a song down, play it straight, and come off as brilliantly as if they’d had an entire 16 piece piece orchestra backing them is truly impressive. Equally impressive is this: They’re in the middle of recording with British producer extraordinaire, Stephen Street (The Smiths, Blur, Pete Doherty,The Smiths!). Taking a break from the sessions, the band snuck out of the studio to talk to Discosalt and answer a few questions. DISCOSALT: In this new batch of songs I hear equal nods to both Brit Pop and American Indie Rock, but overall, it feels very English. Was this a conscious effort or was it just an organic byproduct of you know, actually being from England? 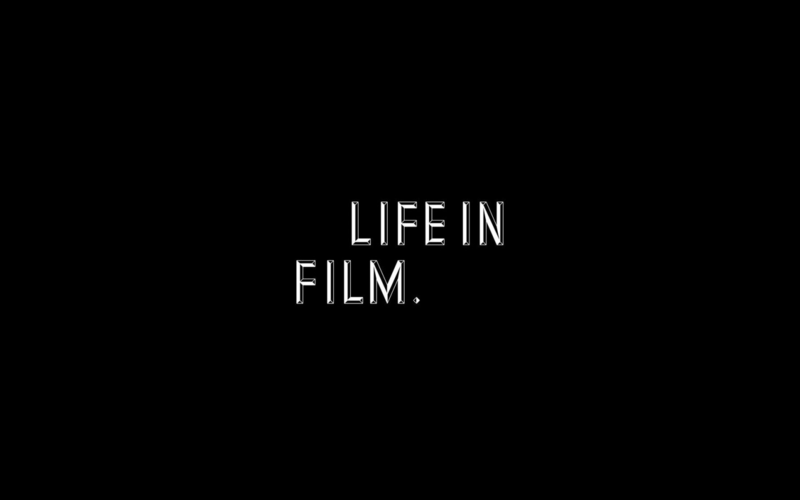 LIFE IN FILM:The whole process is very organic from start to finish for us. Working with a very British producer obviously helps push it towards the British feel but to be honest that’s just the way we sound. D: You’ve posted on twitter that you were really happy with the recording sessions. How did it go working with Stephen Street, the famed producer of The Smiths, Blur, Pete Doherty and countless others? As a Smiths fan, did you get a little star-struck or were you able to separate those two sides? LIF: Stephen is great to work with. He’s got a really chilled approach which works perfectly for us. We are definitely a little star struck. His previous work is obviously on our minds but it’s one of those things where you want to ask but you don’t want to bombard the guy with questions. I’m sure we’ll get some stories out of him during the course of the album. D: How does a Life In Film show go from ordinary to memorable? LIF: That often depends on the crowd to be honest. We have had some absolute shockers like any band. We usually get pretty excited when we’re onstage. D: Other than now, what was the best time period in music? LIF: Couldn’t really say anything but the 60’s could we? D: The London Riots were a few months ago but are still fresh in most of our minds, as Englishmen, how did that affect you/ your state of mind/ national pride? And did it affect this new album? LIF: Me and Sam live in Dalston and the community spirit was great round our way so there wasn’t any trouble for us. There were cars on fire outside Eds house though. He had to spend the night at our house. It was pretty depressing to watch on the telly. It did cause us a bit of a delay as we couldn’t get to the studio to mix the tracks but given that some people had their houses burned down we weren’t going to moan. D: What other artists (musically and visually) would you like to collaborate with? LIF: We’ve recently been working with designer Kate Moross on the visual side and she’s been fantastic. We’re really looking forward to continuing to work with her. D: Who would win in a football match, Life in Film or The Vaccines? LIF: Sam has a mean right foot, we’d smash them! D: What other current London bands are you into right now? LIF: We do like The Vaccines album. We’ve been really busy recently so I haven’t really heard much new stuff. D: You have been to New York a few times now, where’s your favorite place to check out/ hang out? LIF: We’re actually waiting for our first New York trip but will definitely let you know. Any tips?